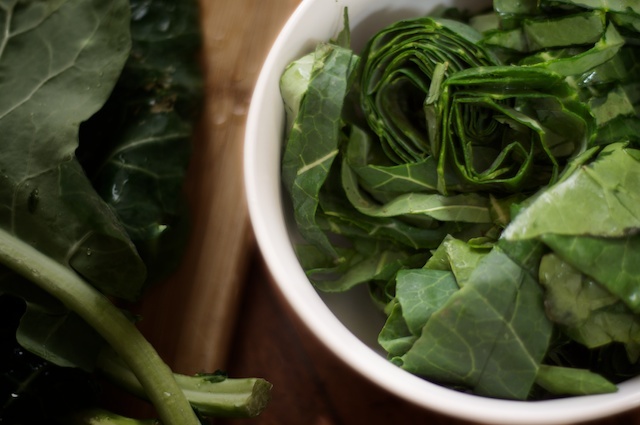 Looking for a collard greens recipe to bring a little luck to your new year? In this traditional recipe for creamed collards, collard greens are gently simmered in fresh cream with caramelized onions and sprinkling of freshly grated nutmeg. Creamed collards speak to the essence of comfort food in a way few other dishes do. There’s easy roast chicken, of course, and Salisbury steak, too, but creamed collards bring the comforting charm of southern cuisine, of soul food. While any number of collard greens recipes – with bacon or ham, hot chilies and vinegar, stewed or braised – can feed the soul, satisfy the tastebuds and nourish the body, for my family, we always settle for the old-fashioned comfort of creamed collards. Traditionally eaten on New Year’s Day, often as an accompaniment to black-eyed peas, collards symbolize prosperity – their broad green leafs representing cash. The more you eat, the greater the promise of good fortune in the coming year. Pork, too, is eaten – symbolizing progress and this creamed collard greens recipe pairs beautifully with pasture-raised ham. Luck-minded couples trying for babies in the new year might try fish or seafoods, symbols of fertility; indeed, there might be a bit of wisdom to the tradition as fish, roe and shellfish are deeply nourishing, nutrient-dense foods for fertility and reproductive health. 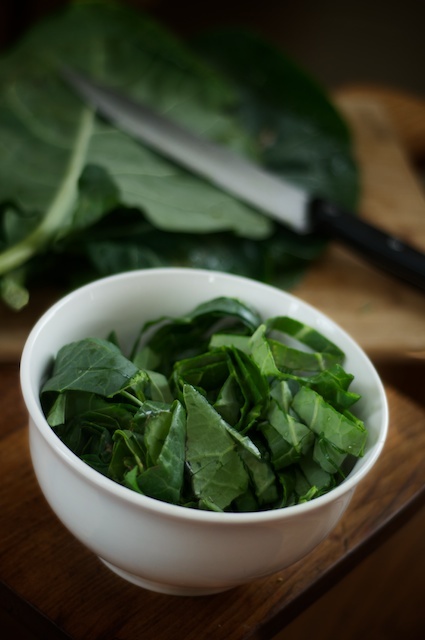 But if money’s on your mind, serve up a plate of collard greens on New Year’s Day. A good collard greens recipe doesn’t attempt to disguise or smother the flavor of the winter green, but, rather, it should complement it – tempering its faintly saline and bitter flavors. For this reason, there shouldn’t be a lot of fuss in cooking. Simple food is often the best food. Whether you stew your collards with ham hock, season them with vinegar, braise them in bacon fat or serve them with heavy cream and butter, choose good quality ingredients – whole foods, natural foods. Foods from nature, and not factories. For even the oft-demonized butter, cream, bacon and lard lend substantial nourishment to the diet, provided their produced from animals raised on fresh pasture. Cream and butter, as called for in the recipe for creamed collards, are rich in conjugated linoleic acid and trans-palmitoleic acid, both of which provide essential nourishment to the body. 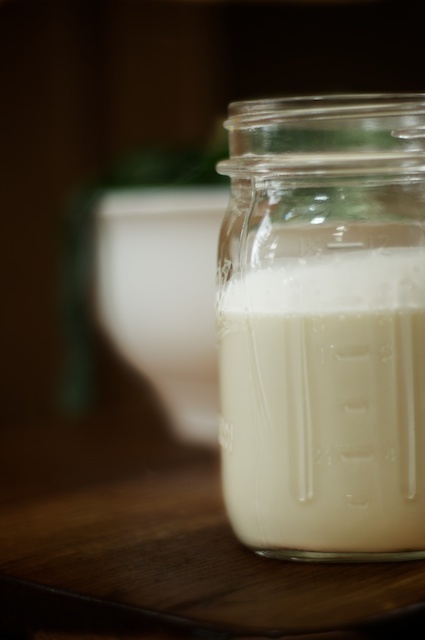 Conjugate linoleic acid shows significant promise in the fight against cancer1, 2, 3 while trans-palmitoleic acid from full-fat dairy like whole milk, cream, butter and cheese may reduce the risk of adult-onset diabetes4. The benefits of full-fat dairy, butter and cream don’t end there; rather, a study of over 1,700 Swedish men indicates that consumption of fruits and vegetables was associated with a decreased risk of heart disease, but only when combined with full-fat dairy consumption5. So serving those collard greens with plenty of butter and heavy cream might do you more good than just satisfying your tastebuds and your soul’s need for comfort food. Of course, these beneficial fatty acids and a slew of other nutrients including retinol and beta carotene are more prevalent in the milk, cream and butterfat of cows fed exclusively on grass. 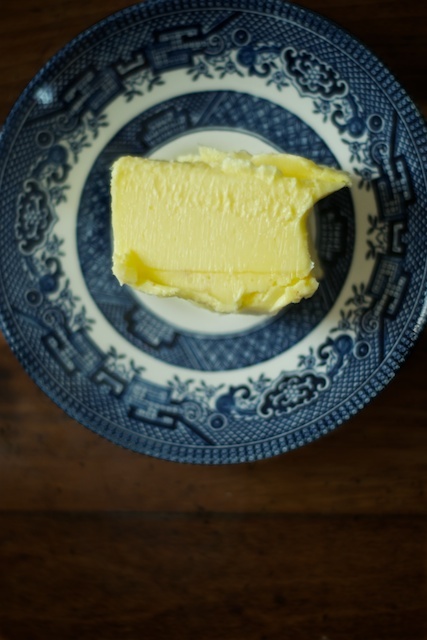 Learn more about why butter is better from the Weston A Price Foundation, a nutritional education group advocating for a return to the traditional foods that nourished our ancestors. 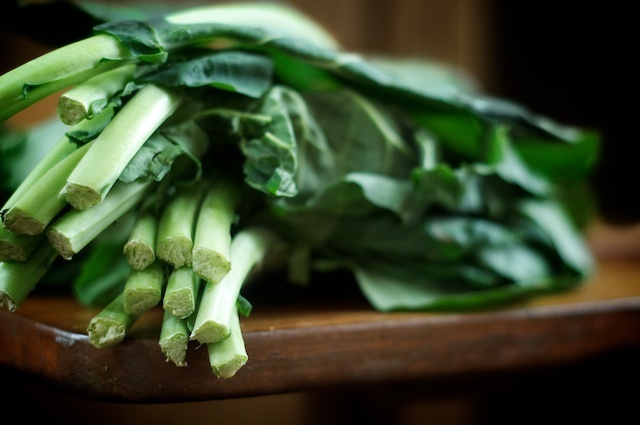 Collard greens are typically a winter food much like their cruciferous brethren – turnips, broccoli, rapini and kale. Though, in my area’s bitterly cold and harsh climate, they’re summer greens – one of the few vegetables that thrives in our sixty- to ninety-day growing season. Yes, it snows nearly year-round here with only two months typically snow-free: July and August. Collards, like all crucifers, are rich in indole-3 caribols, potentially anticarcinogenic components of food6. Collards are also rich in beta carotene, a precursor to vitamin A that’s best absorbed with dietary fat. 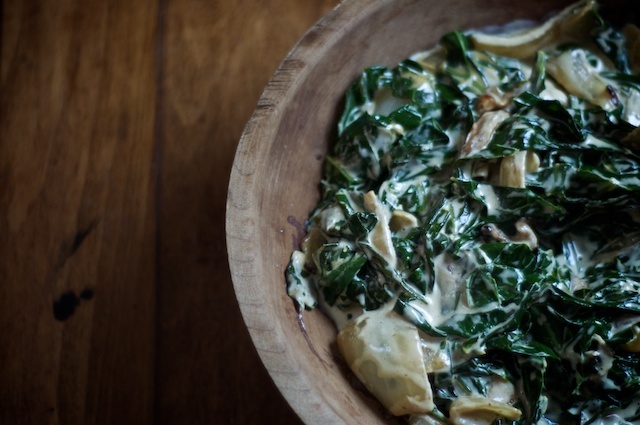 Creamed collard greens, in all their old-fashioned charm, soothe a worn soul. The greens briney undertones pair nicely with the rich, sweetness of fresh cream and caramelized onions. 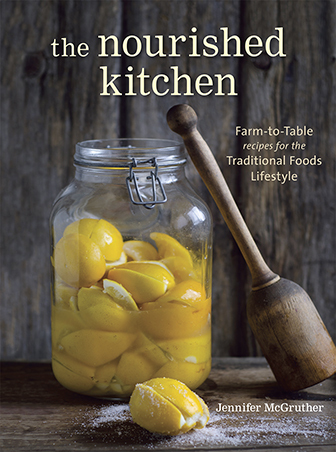 Bring a bottle of fermented chili sauce to the table which adds a punch of heat to an otherwise calm and mild dish. Melt butter in a skillet over a moderately high flame until it froths, then toss in sliced yellow onion, frying in melted butter until fragrant and a bit caramelized around the edges. Add chopped collard greens to the skillet, stirring until slightly wilted, about two minutes. Reduce the heat to medium-low, stir in one cup heavy cream and simmer for about five to six minutes, until the cream is largely reduced. Season with freshly grated nutmeg and unrefined sea salt as it suits you and serve hot. How many leaves in “bunch”? Bunches come in all sizes in our market. Thanks for your great recipes! Hello! Just have to say I LOVE LOVE LOVE this recipe. So forgiving – I didn’t measure anything! And the taste is amazing. So creamy, comforting, and delicious. I took some in to the office and got rave reviews. 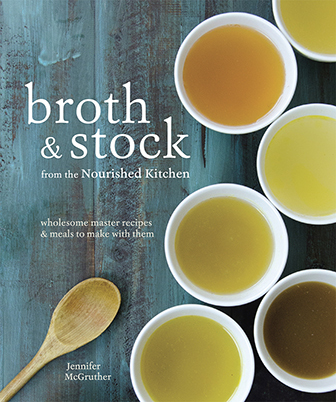 Thanks again for posting this awesome receipe! I saw the pic yesterday and bought the ingredients today. Trader Joes sells Collard Greens already chopped. I used one bag for the recipe, and I think the amount was pretty good. It piled high when I first put it in the pan but after weighing it down with a lid it wilted down pretty well and even more after I added the heavy cream. Came out great! Glad to see a recipe that doesn’t cook the collards for a long time. I grow my own collards and don’t cook them more than 10 minutes after they have wilted in the pan. This recipe is absolutely delicious! Even my MIL who thought I took some healthy greens and made them unhealthy by adding the cream, ate two thirds of it! Thank you for the recipe!